Tutti Frutti Hummingbird Mint (agastache barberi "tutti frutti") - Also known as giant hyssop or hummingbird mint. Butterflies, bees, and hummingbirds will all enjoy this sun loving perennial. 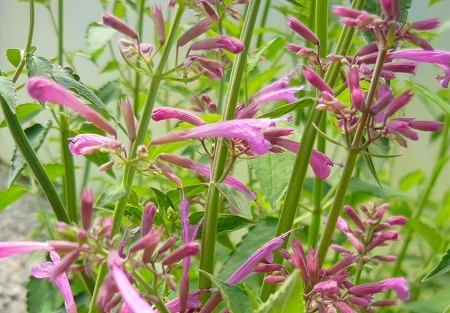 Produces bright pink/raspberry colored blooms on tall stalks up to 3' - 4' throughout the Summer and early Fall . Blooms best in sun. Easy to grow, deer resistant perennial zones 6-10. One live starter plant in 3 inch container.